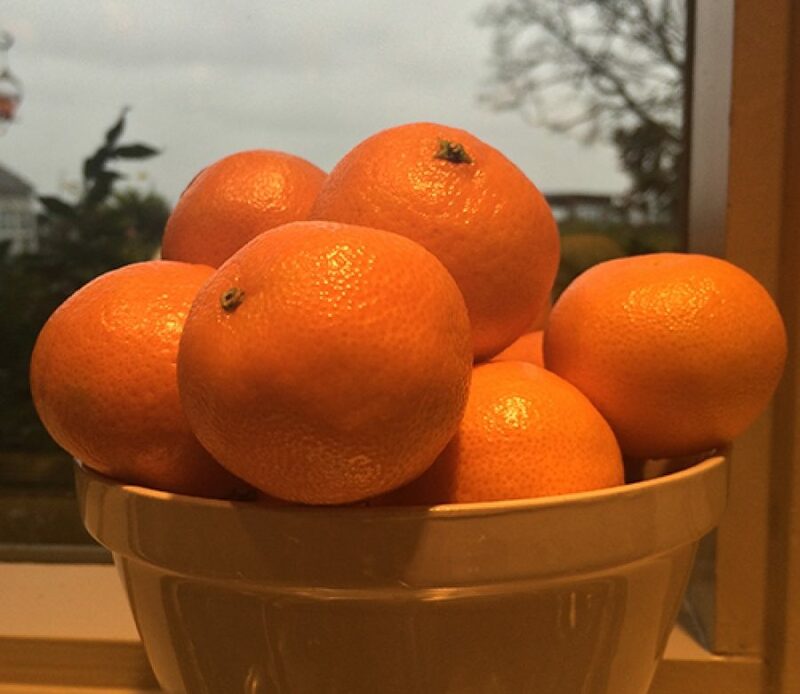 Orange You Glad It’s January? The holidays are over and the calm of January is here. It’s like a big deep breath after the frenetic holiday rush. The first of the year is a great time to take stock, size things up (or down as the case may be) and take an optimistic step into 2016. This season of Northwest weather can make that cheery outlook a bit of a challenge. As the rain and snow bring down the moisture that keeps us so gorgeously green, we need to find some colorful inspiration. Tat, tat, tah da! Let the clouds part for the flash of the optimistic orb. Make way for sunny citrus. When I see a beautiful bowl of oranges, lemons or limes, it always perks up my day. Peel a tangerine and notice the revitalizing fragrance and the way it makes you feel. Citrus keeps life fresh. I mean that in every sense of the word. These robust round fruits have some magical qualities. A squeeze of lemon juice on slices of apple is a great way to prevent them from turning brown, a form of oxidation. The vitamin C in the lemon is an antioxidant and by covering the apple with it, we provide a barrier of protection between the apple and the oxygen that damages it. The zesty flavor of citrus will certainly enliven your day. If you want to brighten the flavor of a recipe, add a little citrus zest or a juicy squeeze, the taste difference is amazing. Make a resolution to try Chef Jeremy’s method of enjoying citrus in his blog that includes a wonderful Olive Oil-Preserved Lemon Recipe. And be sure to visit our waterfront seafood restaurants during our January You “Crack Me Up” Crab Festival and let Salty’s chefs dazzle you with their “Angry” Style Dungeness Crab with sambal orange glaze, sesame seeds and aromatics (the sambal orange glaze recipe is a must try for citrus lovers).